bestPT Billing and EHR Software helps their clients make a smooth transition to ICD-10. Their 5 part strategy called bestPT GEMs Plus ensures that Physical Therapists make the best ICD-10 code selection. bestPT’s code selection tool remains effective beyond the transition helping practice owners to keep up with continuous changes inflicted by insurance companies. Click here to learn more. According to Dr. Eldad De-Medonsa, bestPTs’ President and PhD in Artificial Intelligence, the effects of the transition to ICD-10 will remain unknown for some time. “The only thing that is certain about the transition to ICD-10 is that insurance companies leverage its challenges and uncertainties to delay longer and underpay more insurance claims. Because of a huge increase in the number of codes, a simple one-to-one mapping between the old and the new codes does not exist, as demonstrated in the standard GEMs tool. We leverage the cloud, billing experts, and Artificial Intelligence to analyze millions of insurance claims and generate effective transition rules,” says De-Medonsa. 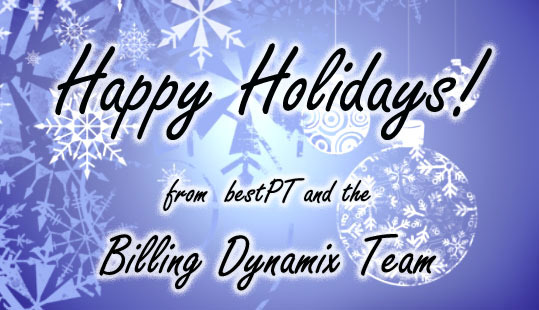 BestPT by Billing Dynamix is a comprehensive cloud-based Physical Therapy Practice Management system that includes intuitive EMR, industry-leading billing, scheduling, and powerful yet simple workflow management. Save documentation time and keep legible and compliant documents. Automate claims and leverage over 2.5 million coding rules spanning 2,500 practice-years of experience. Reduce administrative overhead and foster staff teamwork. 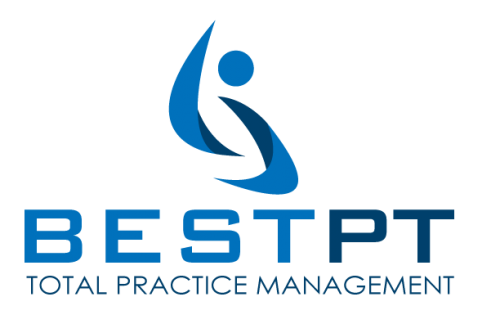 bestPT is the ONLY Physical Therapy clinic solution that reduces administrative time by 70% compared to industry averages – GUARANTEED. 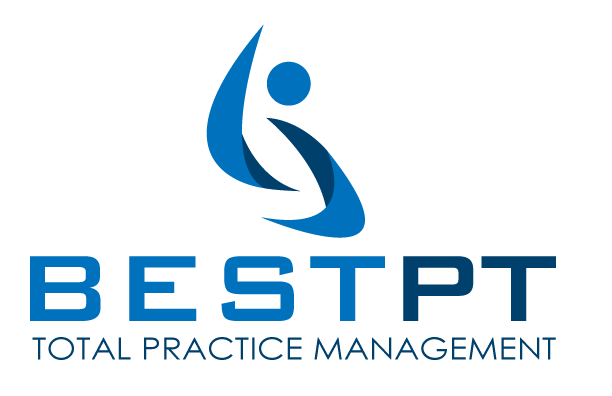 Complete practice management consulting and a rich array of integrated products and services round out bestPT product and service packages. Register for a private Demo+, and review our industry-leading guarantee. Practice owners fail to control and scale up patient visit experience when they rely exclusively on their memory and do not measure their practice performance. Without measuring, practice owners do not know that they have a revenue or a patient retention problem. Learn about it here. Learn about bestPT Billing and EMR Software checklist technology here. bestPT simplifies revenue cycle management through the use of it’s revolutionary workflow management process. More money to the practice creates financial stability for the owner and the employees and results in a stronger practice that is able to grow and serve more patients. Transparent reporting includes real-time automated alerts to notify process owners and participants about any problems or delays. This system enables practice owners to keep track of their claims, along with all other relevant work, in a single location. bestPT helps practice owners create a systematic revenue cycle management improvement process while providing them complete quality monitoring and control. View our free webinar here to learn more. See exactly which claims were underpaid or delayed, and what needs to be done to fix that. At the end of the day, bestPT summarizes all of this information into a single metric that can be monitored helping ensure that no claim is left behind and every underpayment or delay has been followed up on. 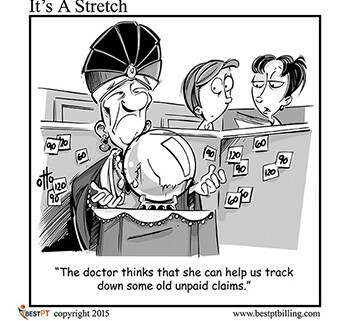 The practice only has to clear one backlog a day with specifically worded instructions to maximize revenue. Any claim not addressed is easily identified by both practice stakeholder and practice success coach to locate the breakdown in process or ownership. Click here to sign up for the free webinar about bestPT’s workflow. 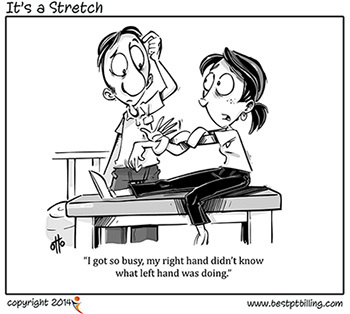 As physical therapists we know the scenario quite well. 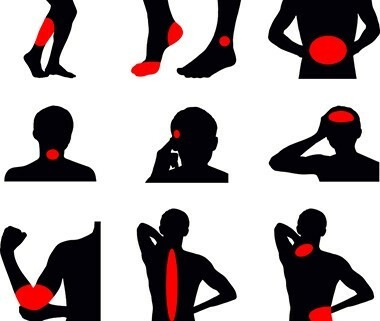 The new patient intake forms come across our desk right before an evaluation and the body chart is completely covered in “X” marks indicating areas of pain. There is no clear nerve root pattern, no dermal pattern, no pattern at all – just X’s spanning across the body. Perhaps there was an initial trauma several years prior, though many times the onset is insidious. Further conversation with our chronic pain patient may reveal how horrified the patient truly is at how their pain has been managed. We know that most of them are not drug seekers for the sake of drug seeking. Chronic and excruciating pain has lead them to seek whatever may get them through their day and many times the pain medications offer a window of relief. We as physical therapists are the most equipped health care professionals to treat patients with chronic pain. So why then have we found ourselves beating our heads against our desk when we fail to make them better? Lorimer Mosely, David Butler, Paul Hodges, and Adriaan Louw suggest that we explain pain to them to get them better. These physical therapists come from various research groups using MRI, Ultrasound imaging, mirrors, and various other techniques to develop a profound understanding of what pain is, how it behaves, and what we can do to treat patients suffering from it. Books such as Explain Pain by Mosely and Butler (of the Neuro Orthopaedic Institute) use beautiful art and laymen’s terms to explain these concepts to patients and healthcare providers alike.2 Mosely’s book Painful Yarns uses a collection of relatable stories to explain how pain behaves (the Australian term Yarns means stories)3. The gift that Mosely gives to patients and healthcare providers alike is humor. The reader gains a sense of neuroscience through anecdotes and analogies in a empathetic and lighthearted manner. It is the job of your brain to protect you. This is a process that has been in place since the day you were born to ensure that your needs were met. When your brain perceives a threat to you, it sends a perceivable message of pain. The importance of this concept is that the ability to correctly and succinctly explain pain to patients is producing results. Anecdotally, it has changed the way I practice. The concept lies in explaining the concept of neuroplasticity, the brain homunculus, and physiological adaptations that take place as a result of the this process. Adriaan Louw of the Spine and Pain Institute explains that the role the sympathetic and parasympathetic nervous system in his series of books Why I Hurt.4 This series of books covers topics including general pain, back surgery, whiplash, as well as pelvic pain. Louw demonstrates his conversations with patients in several continuing education formats. At the end of the day we as therapists are generally good at reviewing evidence based literature regarding pain, neuroscience, and therapeutic management, though conveying this subject matter to patients with a variety of educational and psychosocial backgrounds can be a challenge. The following dialogue is one that I commonly use during evaluations and treatment sessions with patients. I find that this has enhanced my ability to gain trust and build rapport with chronic pain patients. I begin by stating that their case is one that I am familiar with. Many patients feel that their symptoms may be baffling since no single health care professional has been able to explain to them why or how their symptoms persist. Often times I hold this conversation during manual therapy when the patient is lying still and is in a relaxed and comfortable position. I assure them that their symptoms are not in their head, though the brain plays an important role in the experience of pain. I state the following “It is the job of your brain to protect you. This is a process that has been in place since the day you were born to ensure that your needs were met. When your brain perceives a threat to you, it sends a perceivable message of pain. For example, if you fall and sprain your ankle, your brain will tell you that it hurts, so that you will stop walking on it and allow the tendons to rest. However if you were to step off a curb and sprain your ankle, and a bus was coming at you full speed, your brain would not inform you of pain, but to get out of the way of the bus. It is in this manner that the brain decides what the greatest threat to you is. If there was an initial injury to the patient that resulted in a chronic pain cycle I would recount the following: Your brain acts like a security system to your body, similar to how a security system would protect a house. If someone threw a brick into the front window of your home and robbed it, you would buy a very loud, noisy security system, and perhaps get a guard dog. This security system may be so sensitive that it went off when anyone came to the door – not just a criminal. Under a high security threat some alarms go off whenever someone approaches the door. Your brain acts in the same manner to protect your body- it will become weary of normal, non-threatening movements, positions, and activities because it wants to protect you. In this way it can become so sensitive that it does not know the difference between a real threat and a perceived threat. I then explain to the patient that the goal of physical therapy is to address the true mechanical threats and to reteach them safe movements. This dialogue has opened the doors to communication with my patients. My perception of my practice is that I am earning earlier trust and rapport which merits quicker results with evidence based physical therapy treatment of manual therapy, therapeutic activity, and exercise. Fields H. The Doctor’s Dilemma. Neuron. 2011 Feb 24; 69(4): 591–594. Butler D. Mosely L. Explain Pain 2nd Edition. Noigroup Publications; 2013. Mosely L. Painful Yarns. Dancing Giraffe Press; 2007. Louw A. Why I Hurt. International Spine and Pain Institute; 1 editiob; 2013. On April 16, 2015 Congress passed the Medicare Access and CHIP Reauthorization Act of 2015 (MACRA). This act is intended to repeal the flawed sustainable growth rate (SGR) formula, and is the final and permanent piece of legislation in a long line of annual temporary adjustments since 2003 that had prevented the SGR from activating a large payment cut for physical therapists and other healthcare professionals. Most importantly, MACRA further extends the Medicare therapy cap exceptions process to December 31, 2017, and includes numerous other provisions that will impact physical therapy. With the passage of this law, Congress has laid the groundwork for significant changes to Medicare reimbursement for physical therapists and other health care professionals1. 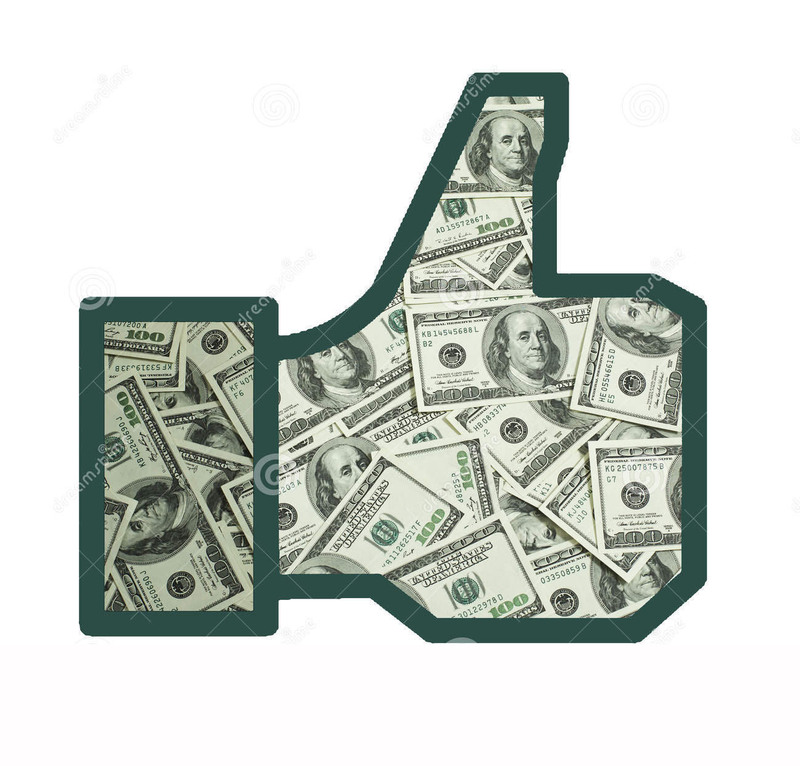 Active immediately, physical therapists can expect to see a positive payment update of 0.5% from July of 2015-2019. Physical therapists and other health care professionals who participate in alternative payment models (APM) will receive a 5% bonus annually from 2019-2024, and the fee for service model is retained. In 2026 and beyond, physicians, physical therapists, and other health care professionals in APMs may qualify for a 0.75% annual update. PT’s participating in all other payment plans will receive a 0.25% annual update. Perhaps the most exciting upcoming advancement is the fact that technical support is provided for smaller practices, funded at $20 million per year from 2016 to 2020, to help them participate in APMs or the new fee-for-service incentive program1. In the private practice domain, physical therapists can expect to continue to report in the PQRS program in 2015, however changes to to the quality reporting system will take place in 2019. Beginning in 2019, the current quality programs under Medicare part B for physicians (PQRS, Value-Based Modifier, EHR Meaningful Use) will be consolidated and replaced with a new program called the Merit-Based Incentive Payment System (MIPS)1. Performance in MIPS will be based on 4 domains: quality, resource use, meaningful use, and clinical practice improvement activities. MIPS will implement penalties for low performing clinicians and incentives for high-performing providers and practices. Bonuses and penalties under MIPS begin at 4% in 2019 and increase to 9% in 2022. Data-reporting under MIPS will be via electronic reporting mechanisms (such as registries). Participation in a qualified clinical data registry would also count as a clinical practice improvement activity1. 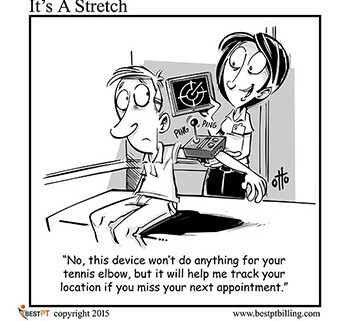 It is again here where we see the value in early adoption of electronic medical record use. Highlights of the Medicare Access and CHIP Reauthorization Act of 2015 (Pub. L. 114-10). American Physical Therapy Association. Available at: http://www.apta.org/Payment/Medicare/. Accessed on June 24, 2015. Medicare Physician Quaility Reporting System. American Physical Therapy Association. Available at: http://www.apta.org/PQRS/ . Accessed on June 24,2015. Outocmes Measurement. American Physical Therapy Association. Available at: http://ptjournal.apta.org/cgi/collection/outcomes_measurement. Accessed on June 24, 2015. Is your Physical Therapy practice Ready for ICD-10? Our bestPT software was ready last year and our Team has made further refinements this year, including testing it thoroughly. We do not expect the October 1, 2015 deadline to be pushed again like it was last year. We have prepared for it by adding over 65,000 codes to our software and when you choose an ICD-9 code, you’ll be able to choose from the corresponding ICD-10 codes. We even give you the ability to test everything with a test patient account. Check with your Practice Profitability Coach for more details. Not our client yet? Then click in the upper right or the bottom left for a demonstration. 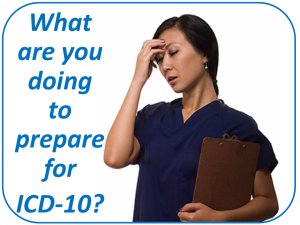 Is Your Practice Ready for ICD-10? The notion that change is inevitable is contrived but true. If at any point health care ceases to change, then we should all be worried, because if there is no change, inevitably there is no growth. The other side of this coin is the notion that change itself produces worry and confusion. The climate of health care in the United States has been forever changed and, come what may, it will not go back to what it was. 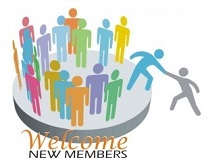 Almost in tandem we are all preparing for the global health care change from the current International Classification of Diseases (ICD)-9 to the monolithic ICD-10 coding system. There is no need to enter a sympathetic nervous system frenzy as long as you are educated on what to expect and have an electronic medical record system that will support your business and transfer to the ICD-10 system in real time. If you visit the government site http://www.cms.gov/Medicare/coding/ICD10/index.html, you will be instantly greeted with a ticking countdown to the October 1, 2015 ICD-10 compliance deadline. Those who are paying attention recognize that the initial set date for implementation was October 1, 2013. As if awaiting a rapidly approaching train in a station, we scrambled in attempts to prepare staff, billing systems, patient’s, anyone involved in implementation or reception of health care. Then we learned that the change would be delayed one year to October 1, 2014. More scrambling ensued. And then in August we were informed that yet again the change would be delayed for one year to October 1, 2015. Hopefully, this time around, the world will be prepared. ICD-10 coding compliance pertains to any healthcare provider covered by the Health Insurance Portability Accountability Act.1 This of course includes physical therapists, many which are concerned about the cost surrounding updating their technology and training staff. The center for Medicare and Medicaid services (CMS) has created an online module titled The road to 10 available at: http://www.roadto10.org/. Within this site one may find tips for implementation for small practice. A five step plan is provided in effort to guide practitioners to preparation complete with a printable checklist. The Road to 10 plan includes steps such as “updating your process” which pertains to analyzing company policies and procedures, and analyzing the quality of documentation supplied by staff. The next step is the elephant in the room for most clinics. 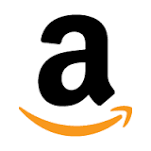 This involves engaging with partners and vendors and includes recommendations for technology staff. The CMS recommends ensuring that your electronic medical record vendor has updated their software and is compliant with all codes updated. A key question to ask is whether or not the version of EMR that you are engaging in has 5010 capability. This will indicate whether or not you are able to submit your diagnostic coding to third party payers3. This is also where grumblings from clinicians who have held out with paper charting may be heard echoing through the canyons. At this point physical therapists have not been mandated to switch to electronic medical records (EMR), however all of our peers have, including family practice doctors, podiatrists, and chiropractors. It is speculated that this may influence referral patterns to physical therapists from referral sources who do not have the capability to send and receive paper charting from those physical therapists who have declined to engage in EMR. This may create further barriers for these clinicians when the ICD-10 changes come about as training billing and coding staff who operate on a paper based system may take time away from current clinic tasks, and may result in human errors that can be costly. In this regard, EMR can be an enormous asset to small physical therapy practitioners, and the ability to accurately code, and bill electronically can pay for itself quickly due to expedited and improved reimbursement from payers. With the fear of change one may seek comfort in the fact that Current Procedural Terminology (CPT) codes will not change for the outpatient realm. What we will find when we receive or implement diagnostic coding under the new system is that the terminology is much lengthier and highly specified. For example, instead of an ICD-9 code of 724.2 Lumbago, under ICD-10 coding the diagnostic term becomes M54.5 Low back pain due to intervertebral disc displacement, or perhaps M54.5 Low back pain due to pregnancy; the diagnostic code involves mechanism of injury and highly specified features of the low back pain (with or without radiculopathy, etcetera). In the end, the train that is ICD 10 coding is approaching us, and we must board in order to continue practicing physical therapy. Get yourself a map: The road to 10 by the CMS is a good one, and pack your comfortable shoes. In the end we choose our attitude, we can embrace and enjoy this trip with the right amount of preparation and protection from appropriately updated EMR as our insurance. bestPT EMR is ready for ICD 10 and staff is available to guide each individual practice in their implementation of our new coding system. ICD-10. Centers for Medicare and Medicaid Services. Available at: http://www.cms.gov/Medicare/coding/ICD10/index.html . Accessed on June 3rd 2015. The road to 10: The small physician practice’s route to ICD 10. Centers for Medicare and Medicaid services. Available at: http://www.roadto10.org/. Accessed on June 4th 2015. ICD 10 Fact Sheet: Basics for small and rural practices. Available at: http://www.cms.gov/eHealth/downloads/eHealthU_BasicsSmallRuralPrac.pdf. Accessed on June 4th 2015. 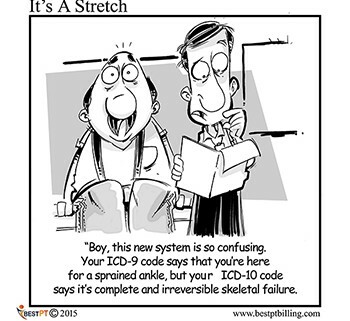 ICD 10. American Physical Therapy Association. Available at: http://www.apta.org/Payment/Coding/ICD10. Accessed on: June 4th 2015.